Going to the gym can always be intimidating. 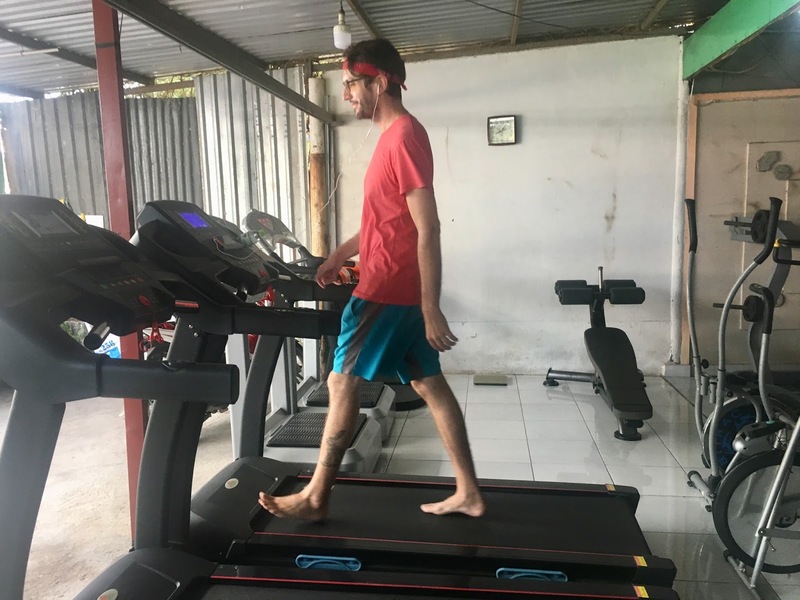 What about going to the gym in another country? Just think about it and your mind starts racing: what if it's dirty? No one can answer my questions? There are only filthy squat toilets? Equipment is unsafe? What if everyone laughs at me? I'll let you in on a little secret: no matter what you do as a foreigner in a new country, people will probably laugh at you. Especially if (like Warren) you're a 6'4" white man in Southeast Asia. Don't let that hold you back, or it will hold you back forever. Vietnam is an increasingly popular travel destination, especially for budget travelers and foodies. Although the North is quite popular, most travelers spend some time in Ho Chi Minh City (Saigon). During our six week stay in District 8, we decided to leave our fears at the door and join a gym. 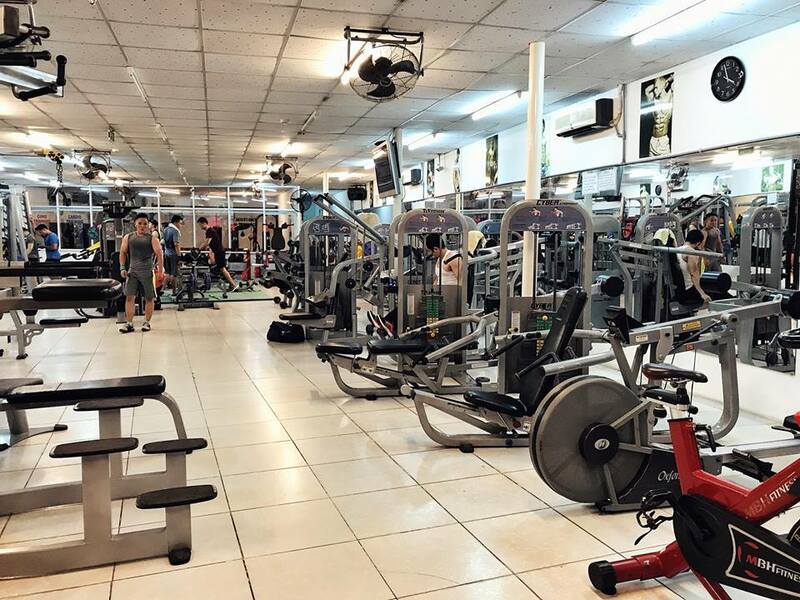 We also joined a local garage-style gym in Long An province (a southern Saigon suburb) for a month. So what's it like to work out in Vietnam? 1. Pro: it's cheap and high quality! 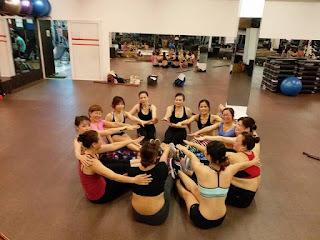 Our membership at Vesco Gym for 18 visits or classes is only 350,000VND, which at the time of writing works out to about US$15.40. That's about $0.86 per visit. For this price, you're probably picturing a prison yard teeming with smoking tattooed gangsters and/or dirty steroid needles. Wrong! In our experiences, the gym equipment in Vietnam is high quality. 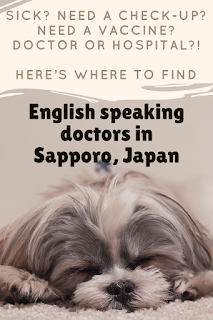 Each visit gives you access to well-maintained and signed (in English!) exercise machines, many cardio options (ellipticals, bikes, fancy treadmills), plus free weights and massage chairs. This is a legit, well-stocked and well-maintained gym. If you need guidance, you can take a variety of classes like aerobics, yoga, and different martial arts. 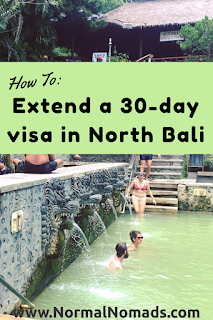 They will be in Vietnamese, but instructors will usually try to help you if you're completely off. Monica has been taking excellent hour-long yoga classes... for $0.86 a piece! Vesco Gym, image from its Facebook page. 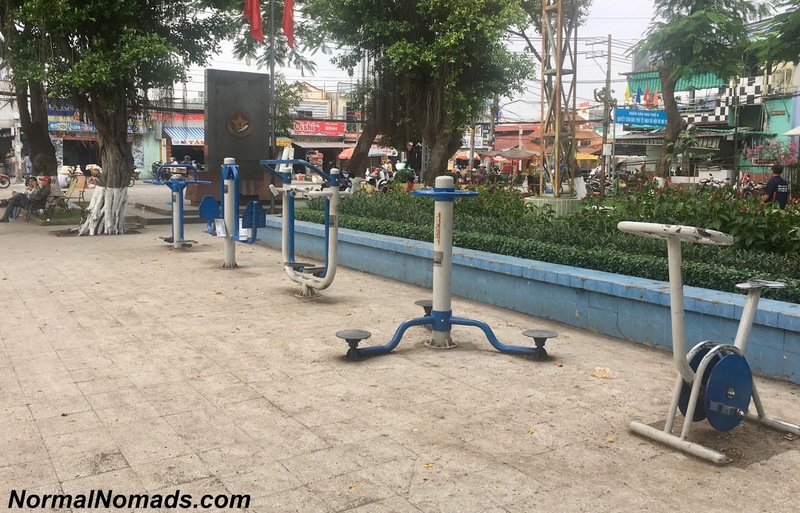 We﻿ also signed up for a local no-frills gym in Long An province, where a one-month membership was 200,000vnd per person -- or just under $9. 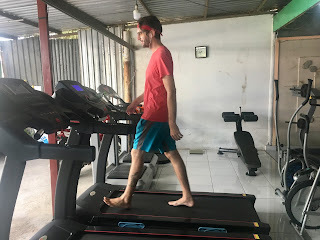 It was less fancy and didn't offer classes, and we got to experience the treadmill barefoot! 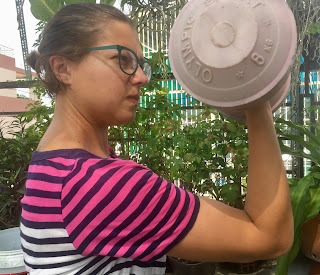 We had a great time lifting weights and getting fit nearly every day. $9 a month was completely worth it. 2. Con: no air conditioning! There are fans, and sometimes they're even turned on! To be fair, there may technically be A/C at a gym, but it won't keep it cool enough for you to notice. 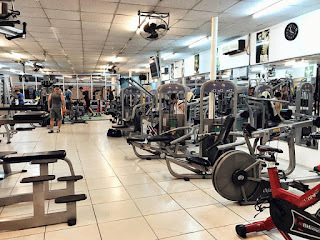 I think it's fairly standard for local gyms in Vietnam (that is, gyms that aren't aimed at foreigners) to have little to no air conditioning. Option 1 is unnecessary for us and we have tried 2 and 3. We highly recommend trying out a public park first, because this might be perfect for you and it's free! Even within the gym we pay for, you'll find variety: different ages, different approaches, and massage chairs with normally dressed people sleeping in them. Whatever, we all need naps sometimes, and the Vietnamese love to nap. Some typical public park workout equipment. Much more interesting than a regular gym! 4. Con: everyone wants to talk to you! 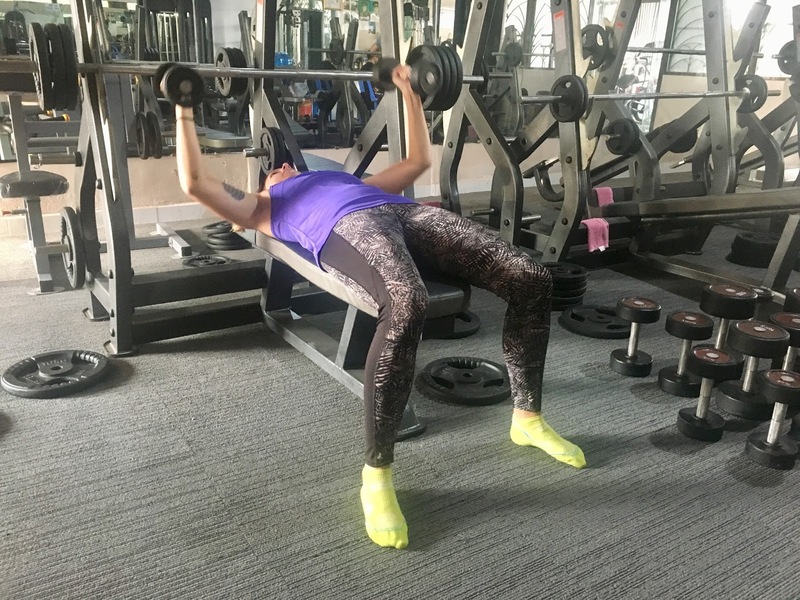 This may not be a con for you, but we both often want to go to the gym and have a solo experience. Unfortunately, the gym is just like everywhere else in Vietnam: if you're clearly foreign, people will want to make friends, speak English, know about where you're from, find out if you have children... basically, Vietnamese people are insanely friendly, but we are grumpy, so we hate it at the gym. Solution? Wear your headphones the entire time, even if you're not listening to anything. 5. Pro: Vietnamese people don't sweat everywhere! This is only worth mentioning because of how gross this is in American and Australian gyms. Yes, people sweat at the gym. Monica is maybe the sweatiest woman of all time. But there's no reason to leave a dead-body-chalk-outline of sweat behind you on every piece of equipment. Maybe it's because it's always hot in southern Vietnam, whether or not you're working out? Maybe Vietnamese people rest more between sets? Maybe Americans and Australians need to show off how hard they're working by creating a sticky moat of sweat splatter around them? 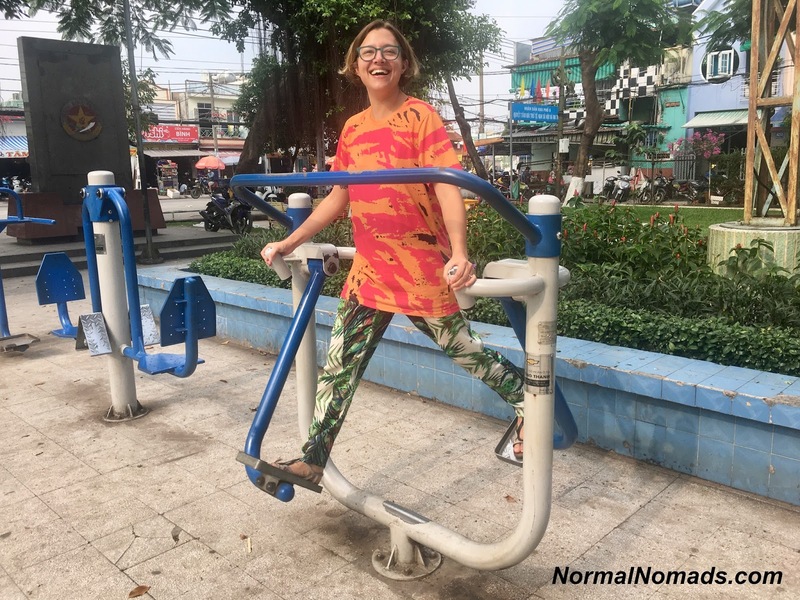 Whatever the reason, you just don't see the level of gross public sweating -- and leaving it behind -- in our gym in Ho Chi Minh City. 6. 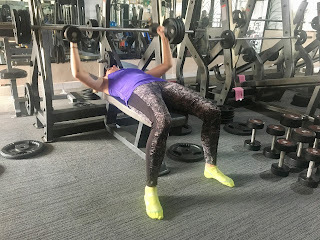 Con: people wear flip flops while using weights! ...and every other piece of equipment. I get it, sandals are life in Vietnam. It just makes me nervous to watch you dead lift while wiggling your exposed toes. After signing up for a more garage-gym style spot, even WE started going barefoot or wearing just socks. 7. Pro: appropriate respect for personal space! This is not to say that no one will touch you. People will touch you. This is to say, that once someone is done using a machine, they get up and let someone else use it. No one takes over entire circuits, or calls dibs on a bunch of free weights. Again, this is speaking as an American, but it's pretty nice to feel like you're not competing for space when there is clearly enough space, just because some gym rat is marking their territory. Pro: friendly Vietnamese people. Image from the Vesco Gym Facebook page. 8. Con: sanitation is not A+! There's no sanitation of yoga mats after you use them, and I didn't see any cleaning wipes hanging around. That said, the gym employs full-time cleaners who walk around tidying things up and wiping down equipment. The bathroom is clean, and this place doesn't smell like a gym at all. Vietnamese people seem to keep things fairly sanitary, even if it's not quite a hospital room. Maybe A- on sanitation. 9. Pro: instructors will push you! Monica's yoga classes have been remarkable. She's held positions that she has never been able to even attempt, all within a safe and informative environment. The yoga instructor is direct and very pushy and doesn't take "I'm tired" or "I'm not strong enough" for an answer. Sure, trainers should always be like this, but in a mixed-ability, under-$1 yoga class, it's rare to get such direct and aggressive encouragement. It's very honest, and very Vietnamese. Quite the family feel! Image from the Vesco Gym Facebook page. 10. Con: instructors will literally push you! OK, touching is weird for us, and for some people this might be a deal breaker. This definitely left Warren feeling pretty uncomfortable. Without any warning, in an attempt to help, a gym worker grabbed Warren's head and pushed it into position on a pad. In the US, this would be suuuuper weird. In Vietnam, people are just more OK with touching you. They mean no harm. In America, yoga instructors will give you tips, but will usually ask before manually adjusting you. Monica has never been touched by a yoga instructor without permission... until now! We're not talking a gentle "move this leg here" or "let's help you stretch this out." Monica had the yoga instructor clamp her legs around her and shove her body into position, about 15cm beyond her original stance. Jarring... but I suppose, helpful! Bonus "Pro"! Post-gym fresh sugarcane juice! There are nước mía﻿ carts all over the place that sell freshly pressed sugarcane juice for about 5000vnd (less than $0.25). It's exactly what you want after a workout! There you have it! 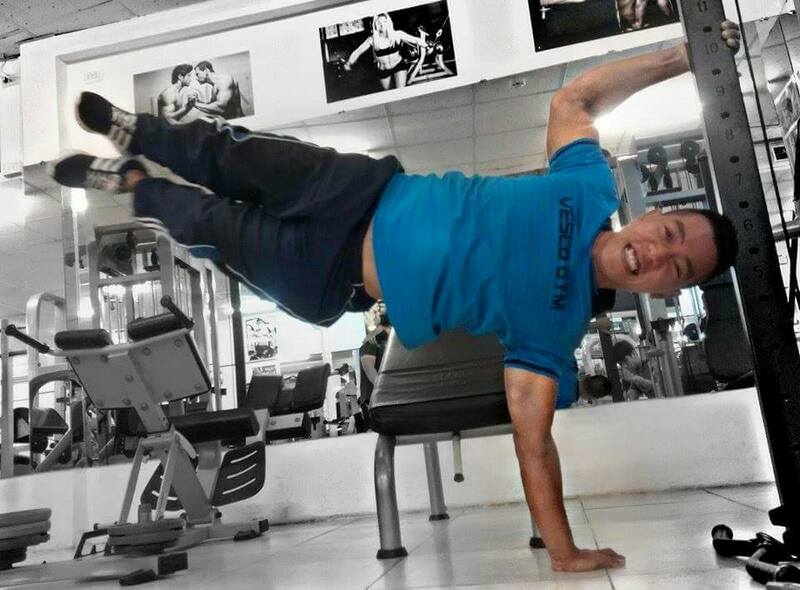 The gym in Vietnam is just like Vietnamese people: nice, unimposing, ultra-casual, and overall great. 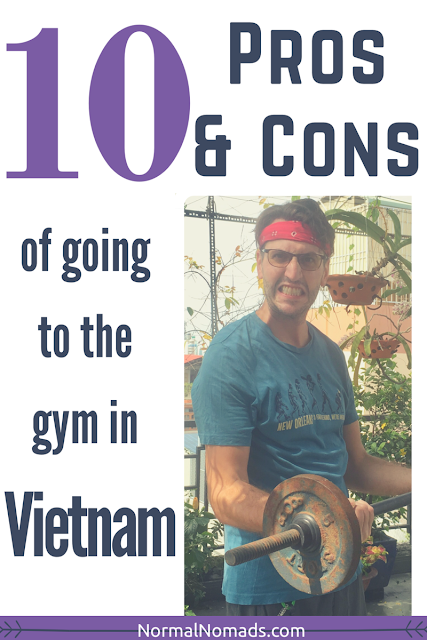 There are pros and cons to Vietnamese gyms, but the pros definitely outweigh the cons. 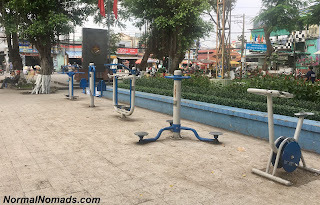 We very highly recommend that during your visit to Ho Chi Minh City, Vietnam, you make your way to one of the local gyms. You don't even have to speak Vietnamese to be welcomed with open arms. Did we mention that Vesco Gym offers under $1 visits?! 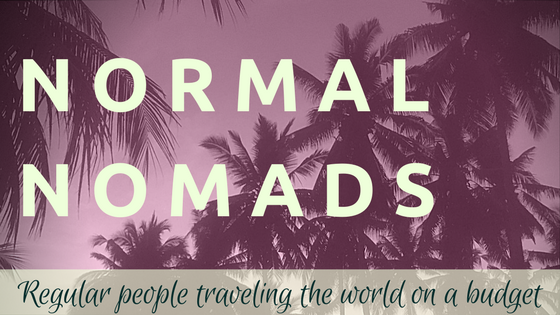 Want more travel content? Check out some other popular posts below!